Ornette Coleman's sax is squealing on the CD player, and Frank's studio is beginning to heat up from the Spring sunshine. Seated, sitting about six feet away from the wall, he picks up a plastic garden spray bottle, and sprays water on his pinned yellow canvas. The nascent painting is already covered with paint, predominantly yellow, but with splurges of pink, of turquoise, of green. Its surface a myriad of marks, brush scumblings, finger and stick scratching, paint washed so thin you can see the canvas weave, and layered so thick it coagulates in blobs and gloops. The visual play matches the swirling freedom of the jazz you can hear. Every painting begins as a title. A memory or an idea. 'False start', 'Fire Next Time', 'Forgetmenot'. Frank starts work with colours and shapes that seem to fit the idea, but very quickly the painting itself takes over, "it tells me what to do" he says. The final title of the picture is not the one it began with, it has become something else. It has become a journey; it begins with an urge to capture or create something, it travels through experience, is affected by the maelstrom of ideas that come from half a century of making art, is inflected with references to other art - everything from Rembrandt to Chinese painting to African sculpture - and ends up as itself, something fresh and unique. 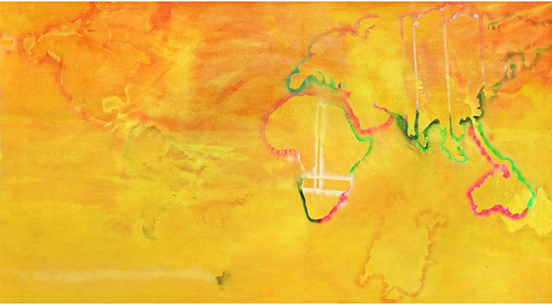 Frank Bowling is in the front rank of Britain's artists. A contemporary of David Hockney and Allen Jones, Frank is a Royal Academician, he has been exhibiting since 1962. His work can be found at the Tate, the Whitney, MoMA, the V&A, and almost countless other museums and private collections. He has been travelling to New York since the 1960s, and has a home and a studio there in Brooklyn. If you were to make a joke about Frank being a jet-setter, he will turn his gaze on you and say "I find it makes me want to sleep most of the time". Its so clear what matters to him, what has always mattered, is his work. He has had the studio in Peacock Yard for thirty years, when he first came, it had a basic dirt floor. 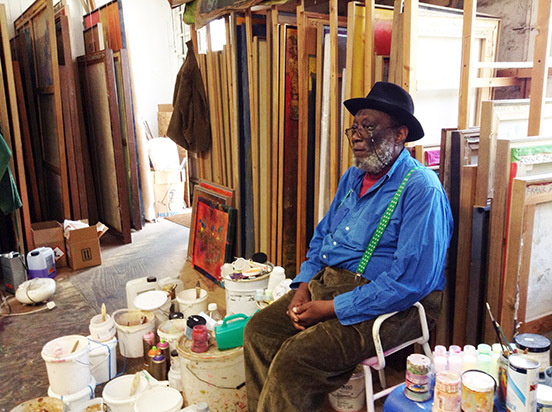 Frank's students have slowly built it up - he has that effect on people, such an open, gentle, devoted man - they have laid a floor, installed painting racks, perhaps even filled the spray bottle and turned on the Ornette Coleman.